Now that school is coming to a close for most of us, we are trying hard to keep the momentum up for learning this Summer. Our Summertime School ideas will cover all subjects and easy ways to practice old skills and teach new concepts together as a family! Today’s Summertime School is all about practicing handwriting… on the wall! 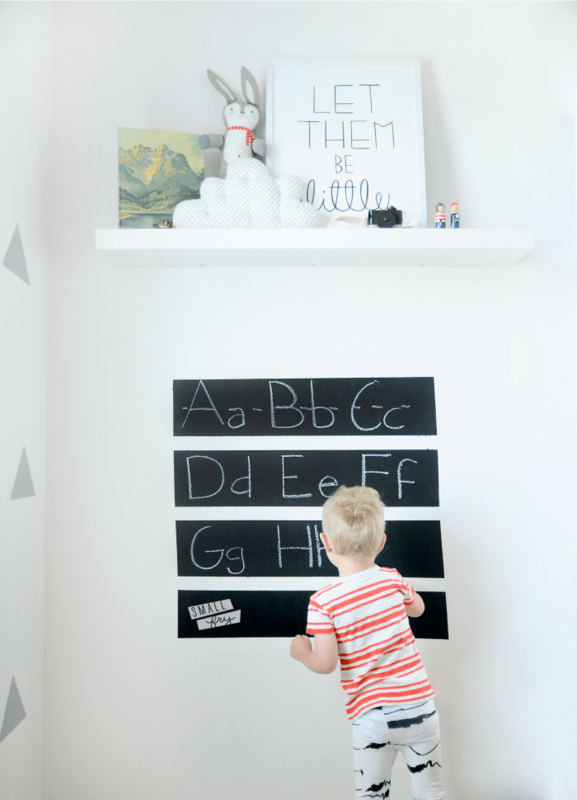 With a simple can of chalkboard paint, you’ve got the perfect place to get those letters and numbers down. The project is super simple. Using painter’s tape, create a giant square box – this one is about three feet. Then using the painter’s tape, cover three horizontal lines through the box and paint away! Once it’s dry remove the tape and you’re good to go! Our awesomely genius Small Fry Facebook Community had an awesome tip for cleaning chalkboards, too. Can you guess? Soda! Wet a paper towel with your favorite (or least favorite, don’t waste the good stuff!) soda pop and wipe down the board. We’ve also heard to lightly cover the chalkboard with chalk before your first use will help the chalk come off easier. Any other chalkboard tips you’ve found? Looks like fun! As a teacher, I think the best thing a parent can do for their little learner is to extend skill practice into summertime! 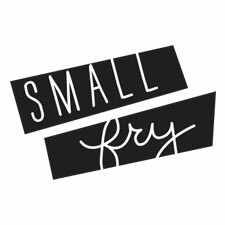 Nice work, small fry. kelly you’re amazing AND a teacher! we admire you! Hey, I was wondering where u got your floating shelf. Where is your “little” print from? Love!! the print is from hellomaypole.com! We bought some big vintage picture frames at a thrift store (think something you’d see at your grandmothers house during the 1970’s) and turned them into chalkboards by cutting down some pieces of mdf board to size and painting it with chalkboard paint. Come to think of it, I still have one around here somewhere….totally going to hunt it down right now and instagram it!! Love your summer school chalkboard idea!!!! So cute! I love this!!! Love this – blogged about it – http://cimmermann.co.uk/blog/half-term-crafty-design-projects-kids/ hope you like it!